Today we have two sneak peeks for you, the first is Carolyn King's highly anticipated set, and her second to benefit the Alzheimer's Association: "Warm Winter Wishes". This card uses Pure Luxury White for the adorable snowman image and the new Cranberry Tart for the base. Background DP is from the Cosmo Cricket Jolly by Golly pack, isn't that cute like a festive front yard?? I cut the Copic colored snowman out and made a sloping bank of snow using a rotary cutter to make a curvy cut and running a black marker along the edge to match the line art snowman. Then I made a popped up little "thought balloon" for his greeting (because only Frosty can talk, you know!) made from a Petite Scalloped Oval Nestabilitie, an oval and Cropodile punch! I loved the scene just the way it was, so decided not to add any more to it. But I had to make a little coffee sleeve with another sheet from the pack so I could use the little coffee cup from the set! TIP: if you save a cardboard sleeve from a coffee purchase, you can easily wrap it with your DP without needing to measure or make a template by putting Scor-Tape along each side and then pressing to the back of your DP and cutting around it. This DP has little cups and snowmen on it anyway, then I made a little medallion by masking the cup and stamping this fun "Love" word background (also from the set!) over it, then die cut with my Classic and Scalloped Circle Nestabilities. Be sure to attach the medallion with Scor-Tape as well, to keep it from popping off. Now you or your recipient will have a cute coffee wrap they can use all season! Deliver the hot drink with the card or fill the empty cup with candy! The next card uses the Free with Three "Holiday Hospitality" set, one of the main images is this large ornament, but today I did something a little different with it. I have to give credit to my 4 yr old William for this idea, who was checking out the new un-inked rubber on my desk. "What's that?" he asked pointing. I held it up by the top to look like it was hanging and replied, "See?" thinking he would figure it out on his own looking at it that way. "Oh! a candle!" he said immediately. Well, I thought that was pretty cool, it does look like like one of those little ball oil lamps! (That's m'boy, out of the box, at age 4 LOL! it's a family thing... ;)* So I colored the hanging loop to look like a little flame and covered it with Stardust Stickles. I colored the different sections and added these 2 mm adhesive rhinestones strips to the spaces in between, these will be fun to bling up with your different embellishments! Card base is the new Pure Luxury Vibrant Violet. The "Hip to Be Square" background border is colored with red to make the focal point look like it's triple matted, I love that! I popped up the "candle" and colored made a little shadow underneath. TIP: I used the lines of the square frame image for placing my focal point, with the vertical running through the middle of the flame and the horizontal going through the rhinestones, really pulls your focus to the bling and greeting. Head over to GinaK's blog to add your comment to her blog entry for a chance to win the stamp sets being previewed tonight our blogs! Then, check in on Carolyn King's blog - the Illustrator of Warm Winter Wishes. We'd love to have you join us at our Release party Thursday over on SCS starting at 7pm CST. There will be lots of chatter, samples, contest questions, and challenges - you won't want to miss it! Check out Theresa's discussion if you're new to our Release parties for some helpful information to get you started. Today I just used one image from the new Gina K StampTV Holiday Cheer kit and some of the beautiful ribbon and card stocks included. Instead of holly, I decided to make this hanging sprig mistletoe* so I could accent it with the new 3mm white pearls (an exact fit for the berries in the illustration! ), perfect to hang on the tree or over a doorway! :) I colored it with Copics, adhered the pearls, and outlined the ribbon with Versamarker and embossed to give it this festive gold edge. I cut it out and popped it up on the Pure Luxury White pendant diecut, and then adhered that to my Rocket Red Scalloped Square, aren't those Nestabilities die cuts gorgeous layered?! I mean WOW! 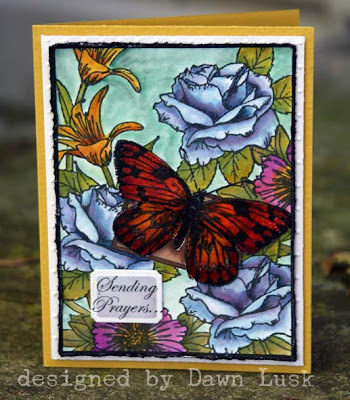 Head over to GinaK's blog to add your comment to her blog entry for a chance to win the new StampTV kit being previewed tonight our blogs! Then, check into StampTV for a new video technique showing shimmering background paper with an image from the new StampTV kit! The party is almost here, thanks so much for stopping in! Sneak Peek: "Hip to Be Square" and "Lord of the Season"
Eeek, I get to show you my newest set today!! This month includes a new frame I've designed with your square cards in mind (or a smaller focal point on a A2 size), called "Hip to Be Square"! This new grid has a symmetrical layout (one of my favorite layouts for square cards actually) that is perfect for framing up images, greetings, buttons, flowers.... anything you like! It has some similarities to the popular "Inspiration Mosaic", and will be a must-have add-on to that set, or a terrific stand alone. I'm also happy to report, a smaller grid this month allowed room for even more images and greetings to go with (or use as tags), and they fit all occasions! You'll love all the new little borders like the stars you see below (think new "stitches" too!) and "stamp embellishments" (this time they look like eyelets!) that you can mix and match with the original mosaic set. Fun, fun!! Here I stamped the new grid onto Cosmo Cricket Jolly by Golly DP, using the 6x6 grid line block made it easy to center it over the candy cane pattern. Then I colored the border with a Copic. This card is just two layers, plus the popped up images, and all the images and greetings you see here are included in this set! The circles can double as snowmen, ornaments and much more(see below). It's wonderful to be able to stamp the faces and nose in separately this way, see how you can "turn their heads" just by stamping to the left or right flipping the carrot nose? :) Card base is the new Pure Luxury Fresh Asparagus. Last I added some tied craft thread (thank you, Donna!) to the ornament toppers (I'd punched through with my Cropodile) to make it look like they are tied to the top of each frame. This "Christmas quilt" above looks pieced, but it's not, and only uses a few layers. Using Vivid Inky blue, I stamped the "Hip to Be Square" frame onto Basic Grey JuneBug DP and then stamped out four of the smaller square outline image from the set on 3 different prints from the same Basic Grey pack. A 1 1/4" square punch or die is a perfect fit for this little squares, you'll love how fast these go!! Now, if you turn each punched square at a 45 degree angle before adhering them in each larger square, the 4 simple panes becomes a beautiful quilting block with triangles in each corner! I stamped "Very Merry!" in the bottom one, and cut out the little ribbon image from the set I'd stamped in Vivid inks on Pure Luxury White for the other three to make them look like gift boxes, you like? (Change up the color and patterns and the Christmas presents magically turn into birthday gifts LOL!) Centered this way it leaves a "5th box" in the middle, I colored the corners next to each of the green squares red as well as the double border to make the pattern a little more complicated. Last I mounted it onto the new Gina K Pure Luxury All Spruced Up and White. Stitched trim around the edges is an embossed Cuttlebug border. I had to share just a simple few projects without the frame, too! Above are some more circles I stamped to make some holiday goodies. Punch them with a 1 3/8" circle and layer onto scalloped punches and you have these easy lollipop or peppermint patty favors! You can also make pumpkins or kids or baby faces. TIP: Make striped knit caps for these round faces by snipping off part of a punched circle of DP and adding a button to the top, isn't that sweet? The buttons and ribbons you see here are from the new Gina K companion collections coming out this month! And, these Hinged window tins can be purchased from Gina K, they will fit 6 decorated patties, and make a wonderful and inexpensive gift! Want to win "Hip to Be Square"? Leave a comment on this post with your guess of what else you think you'll find in this set or holidays you'll have covered I have not shown here! (or if you think you may have found all of them going through the hop, tell me what type of occasion card or project you would make with it first?) I will announce a winner tomorrow night! Next, Nina's newest set "Lord of the Season" includes topiary for all seasons, and a holiday one has this beautiful wreath topper, but I just couldn't resist "pulling it out of the pot" and hanging it from her "Elegant Post" from a couple months back, isn't that perfect? (Just carefully ink up the wreath only, omitting the pot and stamp!) After coloring it with Copics, I added some accents with my Stardust Glitter pen and covered the fruits with Crystal Lacquer. Card Stock is all Pure Luxury: White, Rocket Red, Fresh Asparagus (base) and All Spruced Up. I inked up just part of one of the greetings to frame it on a Fancy Tag die cut. Ribbon is from the the new kit and I also added a punched Large Flourish and some adhesive nail heads. I created the border with some decorative scalloped scissors, Cropodile and some punched fern sprigs. 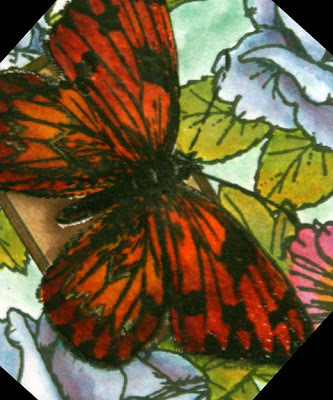 Don't forget to head over to GinaK's blog to add your comment to her blog entry for another chance to win the new stamp sets being previewed tonight our blogs! The September peeks have begun! Our first peek of this release is Theresa's newest set: "Very Merry Christmas", in her vintage style you love! I stamped these beautiful jingle bells and curling ribbons on Pure Luxury White and colored them with Copics. Our next two new sets are from our newest illustrator at Gina K Designs: Tami Mayberry! She really delivered with these special postage theme sets: "Special Delivery" and "Special Delivery Add On"! The main set has some postage outlines with images and words to put inside, the add on set has a large block of 6 stamps together and some journalling lines. I decided to use both on this one sample. I used the large block of 6 and then stamped the outline and ornaments into each frame. Next I cut out the inside of one of the rectangles from some scratch paper and placed it over each framed up image so I could sponge in a yellow or green background. The set also includes numbers to create your own postage rate! I cut them out and then colored in the ornaments and the spaces in between the stamps with a Cardinal Copic to match my background as if it's showing through, this is the new Cranberry Tart again. I also used it for my base. For my mats I used Kraft and the new Pure Luxury Fresh Asparagus, also debuting this month. I Cuttlebugged it with the Argyle Folder and rubbed some Cream White on it to make the pattern pop. The saddle stitched ribbon and buttons you see are "sneak" sneak peeks of this month's new StampTV kit (reveal coming soon! ), aren't they beautiful? Last I stamped the "Happy Holidays" postmark down the side, this is juts one of many greetings included in the set to fit your occasion. Stop by GinaK's blog today to add your comment to her blog entry for a chance to win the new stamp sets being previewed tonight our blogs! Oure sneak peeks are starting Sunday night, eeeek, so excited! * So that means I'm doing Mosaic Monday" a little early, hope that works for you! ;) Today I used the "Inspiration Mosaic" with two images I had never used from Rupa's "My Cuppa Joe", (can you believe it, I always go for the mugs LOL! But the "to go" cup is sooo cute pieced, here I used Basic Grey.) The grid shows me exactly where to put my images and sentiment. I used two Long Rectangle Scalloped Nestabilities behind my Creamy Caramel mat, to match my scalloped punch under the circle. I stamped just the beans repeatedly at the bottom to make a big pile and then colored them with two brown Copics. Card base is Cool Caribbean, I love pairing aqua with brown. The dashed lines at the corners and around the greeting rectangle are fun to match with the border on Rupa's labels. 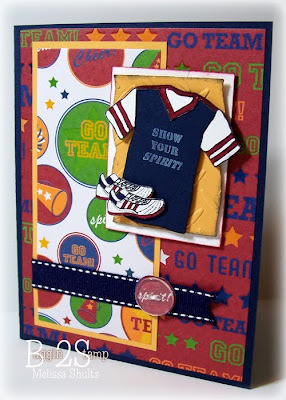 Melissa has created this bright sports card for us today, these beautiful sporty patterned papers are found at Target Dollar Spot!! I got a pack last year to cover all the big sports, the prints were similar but not quite the same and these have some new fresh colors! She used two eye-popping patterns in the layout here that match but have such great contrast. I also love how she used the three different colors for the jersey from "Just So Sporty" and the shoes from "School, Sports, Spirit!" to coordinate. Greeting from the new set is inked up with white craft. The roughed up diamond plate Cuttlebug background (isn't that fun and unexpected in yellow?!) and stitched ribbon are such great little touches. Pure Luxury Card base is In the Navy. Thank you Melissa for sharing this great Target bargain and wonderful card! You were the perfect guest designer for this set and I look forward to more amazing tshirts, sweatshirt and sporty creations in the future! :) Let's go see what else she has today! Look what Geri made for us today!!!! I just can't get over how amazing thes images from "A Year of Leaves" look with these tiny faux stitches! What a "wow"! "I wanted to make my card a quilt card, I saw a quilt done with maple leaves and it was so beautiful that decided to try it. I stamped the image and cut them out, then I sponged them leaving the middle. After I glued them down I ran it through the cuttle bug with the Paisley folder. I then made the stitches with a black pen. On the inside of my card "The fall of a leaf is a whisper to the living" I just love that!!" Thank you, Geri, for sharing your gifts with us this month! It has been such a pleasure!! Here is another project from Geri, click to open! When "Arranged with Love" came out, I just had to send a set to Dawn Lusk, fellow Dirty Dozen Alumni peep and fantastic stamper, she had been doing such gorgeous things with "A Year of Flowers"! Here is a new creation with the set from Dawn, her watercoloring is always magical! I love the beautiful contrasts of the colors she chose and covering the sentiment card with the buttefly to add a smaller tag at the lower left. COLORS/COLOR COMBO: LOVE Fall colors! FAVORITE GINA K SET BY MELAINE: just one?! I guess "Arranged with Love" with her new "A Year of Leaves" close behind! THE MOST IMPORTANT THINGS I’VE LEARNED ABOUT STAMPING/CARDMAKING ARE: to have fun! Work with images you truly love and it will show in your work!! FAVORITE THING TO MAKE THAT AREN’T CARDS: hmmmm, this could apply to the previous answer too..I need to do more things that AREN’T cards! Lol! I’d say, altering items like clocks, picture frames. SOME OF MY STAMPING/CRAFTING ACCOMPLISHMENTS: I’ve been published numerous times in Crafts n’Things, had a cover shot on CardMaker and have been in several other magazines as well. I’ve been a designer for Rubbernecker, Cornish Heritage Farms, Artful Inkables, Dirty Dozen on Splitcoast, guest designer for High Hopes, Gina K Designs, Our Daily Bread Designs (currently), freelance for Janlynn (Stamps Happen) and Creative Cuts & More, and am DT coordinator for Mudd Puddles (just getting a team started). Today I have pics from last week when my little William officially got "sporty" for the first time, 4 year old soccer, here are pics from his first game! Here is pre-game, love how when they are little their socks come up to their thighs! Here he is with his cupcake! I can't believe how lucky I got with this shot, he always moves when I try to snap a pic so you never know what your pic will look like, and I love how the ball ended up right in front of his eye! Score! Thanks for letting me share! :) Have a good one! Today I'm sharing the easiest possible way to quilt this mosaic! Stamp the "Inspiration Mosaic" grid over a light patterned paper, this is from Basic Grey Wassail. Then choose two or three colors from the pattern, here I chose tan and green Copics, and colored in some of my boxes, I love how the delicate pattern shows through, now you have tan and green swatches of a matching print! Card base is a Cranberry to match the patterned paper. I added some 5/8" chocolate grosgrain and frayed the ends after cutting to match the scarf on this popped up "Warm & Cozy Christmas" kid. TIP: The snowflake is a white paper flower, I folded it into quarters like we did in school, snipped out some little squares and triangles, then unfolded it and added a button to the middle to give it a homespun feel. Last I stamped the little circle from my set into the corners and added a drop of Crystal Lacquer on top of each to look like brads. Thank you for joining us for the "Fruitful Harvest" blog hop! The quote about love being a fruit in reach every hand inspired me to put these juicy apples with a pair of the hands from my "Hand in Hand" set! Reaching across the top corner eliminated the need for a ribbon treatment. Images were colored with Copics and cut out, the sentiment is framed up in a Labels Nine die. I left the die on after cutting and sponged on some Antique Linen Distressing ink and stamped a little of the crackle image from "Bold Flowers" to add a little patina to my tag. I loved how these red octagons on the Basic Grey Offbeat print looked a little like apples. :) Card base is Pure Luxury Soft Sand. For even more inspiration with the Fruitful Harvest stamp set, head over to Asela Hopkin's blog, the illustrator of this beautiful stamp set. She has also asked her friend Deb Felts to share a card with us tonight too! "With a 2 inch circle from Nestabilities, I stamped friend and arranged my already colored and cut out acorns around the circle. This was a lot of fun to make, I made two different ones and I was thinking a Christmas wreath theme would look good, also makes a great ornament. " BTW, you can find the winner of the "School, Sports, Spirit!" set from yesterday's hop HERE. Email me your snail mail addy Giovana and I'll get the set to you! One of the first images I drew for the "School, Sports, Spirit!" set was this letter jacket, so "the guy could get the girl", so to speak (cheer outfit from "Sporty Accessories"!) I think this little couple (cut to fit so they're holding hands inside his pocket, see?? ), would be so adorable for sweethearts, anniversaries, Valentines, etc. The color scheme I chose for today is a nod to "High School Musical", hee hee! (but also happens to be one of my fave combos: red, white and black!) I stamped the little "yeah!" on the outfit and MVP on the jacket, these little words in the set are so fun adding to the different strategic spots on all the sports gear LOL! The striped twill ribbon on the clip is the perfect print and texture to match the sporty stripes on the uniform and stretch cuffs on the jacket. I went the whole school theme and hand wrote "Will you go with me?" on the Gina K Pure Luxury White I'd spiral punched, base is Black Onyx to look like a clipboard. Next is a card made with the set and the basketball from "Sporty Accessories". I made a little dotted line toward the popped up call to add some motion and Cuttlebugged the Tiny Bubbles background onto Pumpkin Spice Pure Luxury, perfect color for a basketball! The scoring at the top and bottom bring attention to the additional greeting and make it "extra sporty"! :) The popped up backboard above the mat adds the illusion of some height to the hoop. Nail heads add a little man bling to this card. Would you like to win this set? Tell me about a great "sports" moment for you: maybe it was finishing a cure walk, from high school glory days, one of your family member's victories, watching a historic sports event, or just beating your high score at skeeball! I will post a winner tomorrow night! 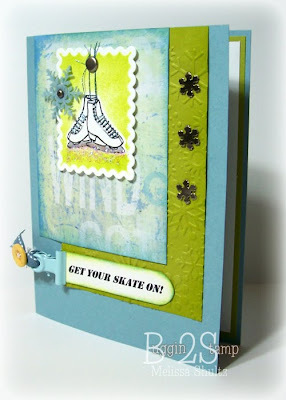 Now hop over to my guest designer Melissa Shultz's blog for a special card she'll be sharing with us tonight. I love the caterpillar and its matching quote in"A Year of Leaves", so I wanted to share a simple way you can create a butterfly using just the images in that set! I stamped two of the oak leaves for top wings and two of the rounded leaves for the bottom ones, colored with Koh-i-Noor pencils, then cut out. Then I popped up the little caterpillar in the center where the body would be as if he's just walking across a little pile of leaves. I love the illusion this hidden picture creates, leaves to butterfly and back again. Jute and Pumpkin Spice CS are from the StampTV kit Signs of Autumn, card base is Pure Luxury White and DP is from the Basic Grey Offbeat pack. typically I pair brownas and oranges with ivory to empahsize the earthy yellow under tone, but paired with white like this gives it a very fresh, modern feel. The Gina K team and guests are hopping tonight with "Elegant Verses", thank for joining us! I finally got around to making the card I'd been thinking about since I first saw the "Elegant Post" set: when Nina came out with this lamp verse in "Elegant Verses" this month, I couldn't put it off any longer LOL! I stamped the post on Vellum CS and then flipped the paper over and stamped it again to create the two sides of the chandelier. I added the pair of birds right side up and upside down to make it a little more ornamental and then added all the self adhesive rhinestones and some little crystal stickers from Stampendous I had. The tiny rectangle and tear drop shapes on the strip were perfect to make the lit candles! I don't have ay chandelier stamps but they've been a very poular trend for awhile now, so I was really pleased with how this worked out! Verse is framed when a die cut Fancy Tag, CS is Pure Luxury White and Black Onyx. The Textile Cuttlebug folder pattern really does look like chandeliers, I embossed it into the card base and the vellum strip under the focal point. It's a beautiful folder for vintage cards. For even more samples of the Elegant Verses stamp set, please visit the Illustrator of the set, Nina Brackett's blog. Nina will be offering her new stamp set as blog candy tonight too - so we hope you'll take the time to comment on her blog for your chance to win this beautiful stamp set! After visiting Nina, hop over to her good friend Silke Ledlow's blog for some special projects she'll be sharing with us tonight. This shimmery card uses specialty papers and the polished stone technique! Begin with glossy CS, drop dots of metallic and colored ink from reinkers, here Gold Encore and Regal Rose, then take a cotton ball soaked with rubbing alcohol and dab and twist onto the paper to blend the colors together to get this marbling effect, it's like magic watching the paper resist and create beautiful patterns before your eyes. Next I stamped the "Inspiration Mosaic" grid in Black Staz On over it, now it looks like an opulent marble tile floor! The mosaic stamp is just perfect with polished stone, you must try! I reverse masked the boxes and stamped in the "Tropical Silhouettes" flowers, then added the greeting. The silhouettes are stinkign stamped directly onto the polished stone. Last I matted it onto Retro Black Glossy Lustre , Retro Gold Glossy Lustre (the wavy lines on this are really cool with the gold marbling ) and Azalea Metallic CS, all from Paper Temptress. With all the shimmer and texture in the stone pattern you create, you really don't need any embellishments! What an easy card, less than 10 minutes! See the Polished Stone technique video here on StampTV. It's great having two guest designers in one month, makes for such fun and different eye candy! :) I love how both, (unbeknownst to each other!) chose to use just one image and one sentiment from the set they are working with to create their cards today! It's all in the details! Geri Utterback is great at creating scenes or coming up with clever uses for stamps, but she is another master at creating a just plain GORGEOUS card with one image, a greeting and lots of carefully chosen details. Check out this beauty with "A Year of Leaves"!! I made a 3 inch square, punched out once on each side. I made a inside square using two sizes of squares. I stamped and sponged the leaf using Tim Holtz ink. Applied a sticker strip in copper around the edge. Thank you, ladies, for your time and talent!!!! Today we are doing a blog hop for Theresa Momber's Autumn Beauty set! It was fun how this card came about: I didn't know what I would make but I knew I wanted to use the sunflower so I stamped, colored and cut it out. After looking at it for a minute, I realized the petals of the flower would look magnificent framed with the points and curves of my brand new Fleur de Lis Pendant die, a chance to use my new toy, hurray! After die cutting the pendant, I had to poke out all the little pieces with a piercing tool, and I noticed how perfect these little pieces would be to use as petal embellishments on the card! Theresa's flower is beautifully drawn, slightly asymmetrical just like the real thing, see how there's a little space at the top right where it looks like a few are missing? So I adhered and popped up several of my new little "petals" as if they are blowing away, but it also looks like they are being swept up right out of the die cut, like a petal explosion! I just love the energy it brings to the card. The greeting from the set is stamped on a yellow oval like another petal, card also uses Pure Luxury White and Chocolate Kiss. For more inspiration, please check in on our Illustrator of Autumn Beauty, Theresa Momber. She has also designed a beautiful digital paper pack called All About Autumn that is available for purchase as well. Be sure to leave a comment on Theresa's blog for a chance to win this stamp set! Hope your weekend is filled with beauty! Congrat Juls! please email em your snail mail addy so i can send your "A Year of Leaves" stamp set! If you have not yet seen the hop and challenge from PCP, be sure to scroll down! And, another hop from the Gina K team, coming up tonight at 10 PM!! A bit of sad news: With mounting family and designing commitments, I have had to make the difficult decision to scale back on my other teams so I can focus solely on my designing and illustrating for Gina K Designs, which includes stepping down from the Paper Craft Planet Supernovas. :( (I never dreamed when I started illustrating in January of 2008 with my first set that a year and half later I would have 22 sets out!) BUT, I am so glad for the experience and friendships I've made through Paper Craft Planet, thank you Susanna and all the ladies of PCP for the opportunity and support! I know Paper Craft Planet will continue to thrive and grow and I will keep sending people your way! Now some happy news: the PCP ladies are throwing a little going away "Best Wishes" bash for me in the form of a blog hop today featuring my two newest sets "A Year of Leaves" and School, Sports, Spirit!" Aren't they the best?? There's nothing like having people wish you well when you are making big choices for the future, I am SO grateful they are helping me do this with their blessing!! :) So blessed!! I'm playing along too since I wish only the best for PCP and all my peeps there! I used "A Year of Leaves" to make a simple fall card with "Bless You", this covers so many occasions and best wishes, too! Leaves are watercolored with peerless watercolors, and I stamped the background mat with the different leaves in Vivid Coffee Bean ink. CS is Pure Luxury. I made 2 little pairs of matching earrings from Polyshrink (stamped in Stazon and colored on the backside with Copics) to go with it using one of the leaf images and the acorn, oh my goodness you should see the acorns in real life: they shrink up so tiny, look like little gem stones, so sweet! (I know what i;m makign for gifts this year!!) I pierced some holes through some matted matching CS to coordinate the presentation. This next card uses "School, Sports, Spirit! ", but in keeping with today's theme I didn't go "sports" or "school" with it, just sending lots of love and spirit with this girly, feel good card! "Go for the goal!" is stamped right side up and then turned over to make a complete circle four times on the mat, and then I layered on some Cuttlebugged heart and circle punches inside each. Really fun to frame up little images and punches with this sentiment! Go for it ladies, take the 'Planet to the top!! To top it all off, Gina K is sponsoring a challenge this week on Paper Craft Planet with a chance to win one of Melanie’s newest sets! Upload a new project with a "Best Wishes" or good luck theme to the PCP gallery with the tag GKDBW by Monday, Sept 14th, 10 EST. A winner will be announced Tuesday, that person will win their choice of “A Year of Leaves” or “School, Sports, Spirit!” Hope you will play the challenge! This blog candy is now closed. Find the winner here. Thank you for joining the Gina K team and our guests for this special " A Year of Leaves" hop today! Today I have a sample that's Pure Luxury: Chocolate Kiss, Soft Sand, and Ivory, that is! They are just the perfect neutrals alone or together, so rich! I embossed the oak leaf from this set in gold EP onto the Chocolate Kiss CS, and colored them in with a Q-tip and bleach! I think this just might be my favorite way to color the leaves now, you can see below how realistic looking the fading light to dark and variety of colors are! Stamp on any earth tone paper and watch the new colors appear as the bleach does its magic! And virtually no "technique" to it either, just dip and rub! I rubbed a little gold metallic paste around the edges of the mat and a little on the punched chocolate oval frame, doesn't the chocolate paper look so beautifully burnished? I added some ribbon and a few of the adhesive nail heads to embellish it. I tore the edge to make a little more distressed and "leafy", then you have a beautiful peek of the inside. I lined the inside with the Ivory and stamped "Thanks" and the little caterpillar, both from the set at the corner. Stamping the oak leaf repeatedly on the envelope flap makes easy coordination. For even more inspiration, please visit our Illustrator of the Year of Leaves stamp set, Melanie Muenchinger's blog. You'll want to leave a comment on her blog because she is hosting a drawing for her gorgeous stamp set there tonight! Would you like to win "A Year Of Leaves"? I will post the winner here tomorrow night! Alicia K has drawn the cutest Halloween set this month "Feel the Magic", with this adorable witchie and cute little props for her to hold in either hand, you will love it! Today I have her riding the broom, I thought it would be fun to suspend her in front of a cut circle, using Classic Circle Nestabilities, for a perfect (and easy!) moon backdrop. Stamped bats in the background are from Gina's "Spooky Silhouettes". Greeting is framed with the new "Fancy Tag" dies, they look totally magical with the punched large Flourishes (Green Apple) to match! Isn't that greeting fun?! "Witch way", hee hee! Here's a closeup. She's colored with Copics, I used C-3, C-5 and C-7 to shade her hat, and added some stripes to her stockings with a pen. Punched stars are Pumpkin Spice, accented with adhesive nail heads, mat and base are Moonlit Fog and Black Onyx. Instead of masking the broom I just cut it out, ten cut the handle in half and ahdered one half to either side of her leg like she is sitting on it. I sponged some Memento London Fog all over the inside to create shadows for the moon when you look at it from the outside. Pumpkin is popped up. As you can see here, her silhouette from the inside is all black: before cutting I adhered my stamped image on white paper to the black so that when I trimmed her out she would be black on the back side. This carries the silhouette theme to the inside. Pop dots are hidden under the broom and hat. My original plan was to hang her from some jump rings so she would swing back and forth, but...this was much easier LOL!